Make sure to install Watch Part of the app! 🙂 It’s a wach face! Is your Android Wear 2.0 opening settings by itself? Find out why and solve the issue. Google is asking you to pay again? 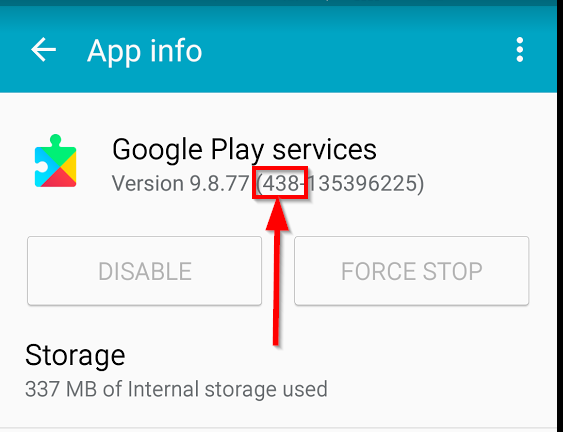 It’s Play Store bug – see how to fix it! It’s a watch face so make sure your watch part is installed on the watch. All the editing and access functions would work after full installation, the Watch Part is most important part of the app, in Android Wear 2.0 version the watch part can even work as standalone – without phone part. In Android Wear 2.0 you can go to the Play Store on your watch(! ), search for “watch faces” and install Minimal and Elegant. In Android Wear 1.5 (older devices) – your installation shoud be done automatically by the system. Is your Android Wear 2.0 opening Settings by itself? It’s because system is new and there are still some hidden “traps” and things to improve. You can avoid that by closing the apps or settings using SWIPE-OUT instead of closing by Side-button. This way you would close all the activities instead of hiding it. To use Android Wear Play Store on the watch, please open it at least once and accept Google’s terms and conditions. 2) You can also find Minimal via Web Play Store and choose to install on your watch. Google is asking you to Pay Again? Still problems? Mail me or ask Google Support for help – thanks! You do place special Tags in text lines and it’s automatically converted to value. It means that you decide which TAG displays text from which complication. The latest requiremeny set by Google for Systems 8 and up (Oreo, Pie and up) is to show notifications if application is doing something in the background. In order to disable those notifications, go to System Settings > Application Manager or Apps & Notifications > find Minimal > open Notifications and set desired level of received notifications -> set Show Notifications to OFF. Lately there are some random issues with Phone to Watch communication – Google is workng on it. The problem was located as a problem of Google Play Services (system libraries). (please match it by matching number versions, all details are shown in the given link and on images below. Open the Android Wear Application on your phone. You will see the icons of three last used watch faces and a button “MORE”. Click the MORE button to see the full list of your watch faces. Select the desired Watch Face and click the GEAR ICON to open the settings panel. 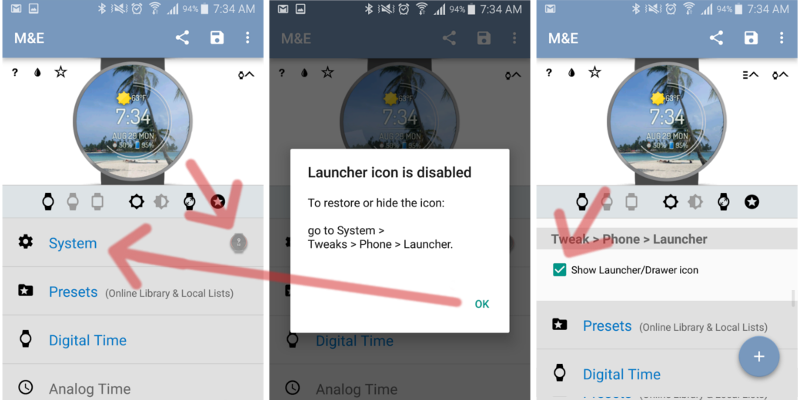 How to enable/disable launcher icon? If a downloaded / purchased Watch Face is not visible in Android Wear, there was a problem with data synchronization between the watch and the phone. in Downloaded OPEN the Watch Face info and uninstall it. Wait a few minutes. Watch Face should be synchronized. If it doesn’t help, the Factory reset of the Watch may be necessary – please contact me via mail so that we can check it together. If your Android Wear application on the phone doesn’t look like the one on the movie (no list of apps). You would need to uninstall the Android Wear and Factory reset your Watch to fix it. In Minimal & Elegant the Custom Time Zones are used for text lines. Now you have the time in the text line. Scroll down to Time Zones sub-section and enable the Custom Time Zone option for that exact line. Then from dropdown choose the Time Zone you would like to display. You can set separate Time Zones for all custom text lines. double-check it, sometimes it is good to disable and then enable the updates or change the provider. If you don’t use static location the Weather needs Location Services to be turned on. Moreover, it needs to allow Google to use your location. Please Exclude the watch face from Batery Savings. If you do not open app regularly Android puts application to “standby mode” and disables it’s crucial services. From the Settings app, tap Battery and then the menu button (the three vertical dots in the corner) or App power saving > DETAILS . Choose Battery optimization – for the apps and see details and exclude / disable power saving for the watch face or other application. Finally, go to settings of the face and disable&enable the Weather in order to force the refresh. If it doesn’t help, change the provider. (Providers may be temporarily overloaded). After excluding please deselect Minimal and Select it as your watch face once again. This option is the most simple and works in most cased. Please say “Ok Google” and use this function 5 times, then the text will disappear. It may be back after several weeks so to disable it say “ok Google” just once. If your settings don’t work, or your watch shows you a notification that you need to update your Android Wear Application on the phone, it means that your watch didn’t update its software correctly. 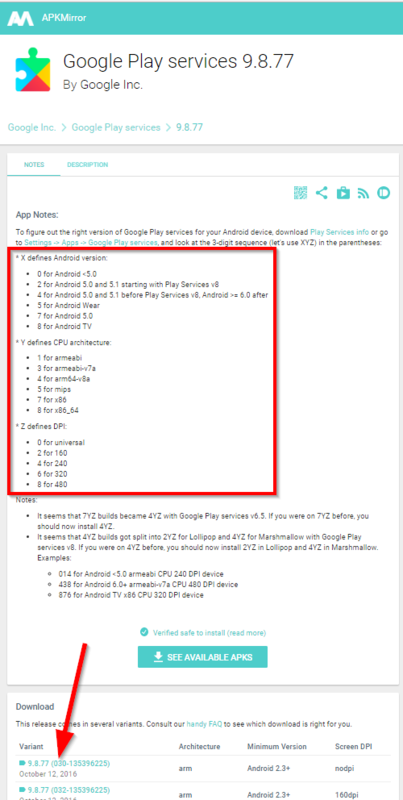 If your Google Play Services is lower than 8.4 , you need to update the system. Why? Because all new software will start to ask for the required update and it will fail to work. Once you update it correctly, it will work efficiently. BUT if it is still lower than 8.4 you will have to do the Factory Reset of your Watch. In some very rare cases you will need to do another factory reset. In this case uninstall all the Android Wear related software on the phone together with the Android Wear. Why? In order to minimize the amount of synchronized data sent from a phone to a watch. It may sound complicated, but sooner or later you would be forced to do such an update if your watch didn’t update the Google Play services correctly. Starting from version 3.4.0.0 Minimal & Elegant gives you option to use One Click install. 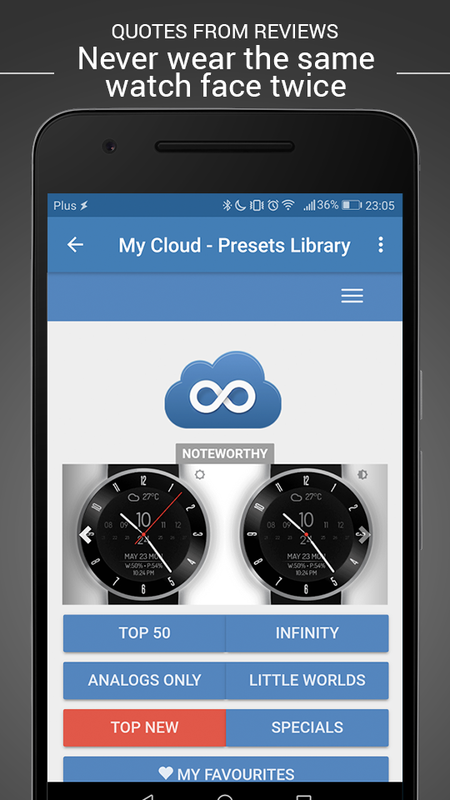 From shared post or any other form – just click the install link and confirm your choice for app: Install Preset (with M&E icon). There are a lot of Top_XY lists, for example Top10 – to get great presets and inspiration! Got lost with presets installing? Some of Tasker users reported that despite having all in good order and having correct settings Tasker reports: No Permissions Error. The remedy sometimes is to uninstall Tasker and the app you try to use with tasker. It may help, otherwise please contact Tasker support or me. If you are a developer or advanced user you may benefit from open API based on Intents. Where “n” is variable name and and “v” is the value. Where “s” is the Preset ID. Where “s” is the Preset ID, “a” is your app name and “c” is command (apply/back). Where “n” is settings_name and “v” is settings_value, from list below. M&E needs sunrise and sunset data along with appropriate weather conditions code. To the mentioned converting service you should provide your weather code received from your provider (WU) and lat & lon. You will get such string as result: sunrise=1457327259000,sunset=1457370041000,code=fair you can split it and assign to the API calls. If you get no appropriate M&E code please mail me I will take care for preparing converting map. Now you can send text including TAGS via Variables (MEV1-MEV6). 2) Then via Tasker plugin or API you can send new text content including TAGS! How to use it? Instead of composing text lines within the Settings, you can place one of variables inside desired line and then compose it in Tasker or other automation tool and sent to watch face. It will be fully converted including all TAGS. This way you can use configurable and dynamic texts in lines based on time or location. At work you can monitor your servers and at home you can show just text with date. It’s important to check it on the watch – not on the phone. All watches should meet those requirements starting back from year 2015. Of course device must be Android Wear watch. That’s it 🙂 Nothing more – as minimal as possible. Excluding the all from battery savings may be done in different ways in different systems. In case of any questions please contact me via e-mail. I will try to do my best to help you.